This installment of the blog was supposed to contain a brief review of the new Denkmeier Powerswitch—the one with the filter slide. Instead of being out at the club dark site with my C11, though, here I sit at the dad-blasted computer. The weather gods have skunked me again. Maybe next week. Ah, the good old days of amateur astronomy! How we pine for them. How those Baby Boom amateurs like Your Old Uncle Rod declaim about them to any of you younguns who will listen. 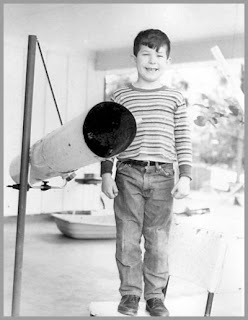 Growing up with amateur astronomy in the 60s was exciting. It was all new and wonderful for us starry eyed teenagers. The times we had back in those days of Mercury, Gemini, Apollo! We were reinventing the astronomy club, inventing the star party, and just generally having a ball like I’ve never had since. Would I like to go back to the amateur astronomy of the 1960s, then? Not on your life, bubba! Most of the folks who listen to us geezers go on and on about the good old days of amateur astronomy have naturally developed a rather romantic notion of The Way We Were back in the 1960s. A time—we tell ‘em—of, for example, Dedicated Amateurs exploring the new art of astrophotography. Tirelessly guiding for three or four hours to record beautiful cooled camera masterpieces whose richness invokes the specter of Ansel Adams. Nice “memories,” huh? As is usually the case, reality was somewhat different. For starters, some people did have the skills to build and use dry-ice-cooled-emulsion cameras, but not me or my friends. Wet behind the ears teenage novices like us wouldn’t have dared to take on a project like that—though we dreamed about it. Back in the 60s, most of us who dared wade into the deep astro-imaging waters were struggling along with ambient temperature Kodak Tri-X, a 400 speed black and white print film that the word “grain” was invented for. We weren’t doing three or four hour exposures either. Or one hour exposures. Or half-hour exposures. Given the “quality” of our scope drives, the vagaries of cobbled together drive correctors, and the difficulty of balancing long-tube Newtonians, we were lucky to get 15 minutes worth of exposure. Because of the inevitable flexure between guide scope (usually a 60mm trash scope “borrowed” from the kid next door) and main scope, stars would be badly trailed even after a measly 15 minutes, even if you were able to keep that consarned star centered in the crosshairs of the guiding eyepiece—assuming you could afford a crosshair reticle eyepiece. What would Tri-X record after a 15 minute exposure on an f/8 scope? Not much. The resulting prints might show an elongated fuzzy-blob you could tell your friends was M13. Oh, and you wouldn’t be able to show your buddies anything until you spent a night in the darkroom, most likely really the kitchen after Mom, Pop, brothers, and sisters had gone to bed. Mama really loved the way he stunk up her kitchen with Dektol and Hypo. For all these reasons, most of us mostly did visual observing even if we dreamed of astrophotography. Before you could observe anything, of course, you had to have a scope. Back in the 1960s, you could buy scopes, sure, but once you got beyond the three and four inchers, they became horrendously expensive (not just for us squirts, but for many adults), so your alternative if a Skyscope or a Palomar Junior was not “enough” was to build. I mean from the ground up, including grinding, polishing and figuring a mirror. Romantic reminiscing among ATMs aside, the truth is, the average home-made mirror of the day was of much poorer quality than the average machine made Chinese mirror of today. Most of us had to rely on a friend who’d made a mirror before to transmit his knowledge (back then amateurs were exclusively male…I never ran into a female amateur until the 70s, anyway) if he had the time and inclination to do so. If not, you had to work through it with only good, ol’ Sam Brown and his All About Telescopes (I still love his wonderful drawings) to guide you. Hmmm...let’s see...LOOK OUT! That stack falls on you, and we’ll be digging you out for weeks! OK...how about November 1967, the Winter after the Summer of Love? The cover has a picture of a geeky looking young amateur (even in 1967, most amateur astronomers in S&T and elsewhere still looked a wee bit less than hip—your’s truly excepted, of course) who’d built his own beautiful and complex-looking hydrogen alpha Solar scope—I admired it muchly and reread the accompanying article many times. What’s inside, though, scope-ad-wise (today’s equivalent dollars in parentheses)? Questar 3.5. $795.00. ($4836.00). Might as well have been a million bucks as far as I was concerned. Celestron Pacific C16. 16-inches of pure joy for $11,500 ($70,000.00)! Might as well have been two million. Unitron? You could get their beautiful 4-inch Photo-equatorial achromatic refractor for a mere $950.00 ($5779.00)--it even had a MOTOR DRIVE and a camera mount. Just don’t ask me what you were gonna take pictures of with this super-long focal length 4-inch. Cave reflectors. The 8-inch Deluxe might be IT if you could knock over a liquor store with the $625.00 ($3802.00) in the till that you’d need. Couldn’t afford the real fancy-schmantsy? As above, you could stick to 4-inch and smaller Newtonians; perhaps the cute 4-inch Dynascope Newt. This one came on a little GEM mount with an AC clock drive. Sorry, pard, but you’d still have to mow a quite a few lawns to raise the $109.95 ($668.00) you’d need to send Criterion’s way. Maybe ask Daddy if he wouldn’t mind turning over a paycheck or two in the service of your quest for astronomical glory? Hope you could run faster than the Old Man! Assuming you obtained something that could at least roughly be described as a “telescope,” yeah, your focus was gonna be on visual observing. That wasn’t easy either. It wasn’t just the limitations imposed by our small aperture telescopes (back where I came from, an 8-inch was a big scope), it was the fact that we didn’t know what to observe or how to observe. Going beyond the Messier was scary for a lot of folks. Way back when, for example, a lot of people considered Cygnus’ Veil Nebula an “impossible object.” Even if you thought you’d try for The Veil, you’d have a lot of trouble finding it. If you were like me, your only “finding tool” was Norton’s Star Atlas. Norton’s is a lovely book as James Michener said in his novel Space, but it wasn’t so hot when you were actually trying to use it at the telescope. It did plot some non-Messier objects (the NGCs were not labeled as NGCs, however, but with archaic Herschel Numbers), but since the atlas only went down to mag 6, there usually weren’t enough guide stars to make finding even bright Messiers easy. If you did somehow stumble across The Veil, you wouldn’t see much of it because of the eyepieces you had to look at it with. Sure, some amateurs back then had collections of Erfles and Orthoscopics that would be fairly respectable performers even today. Maybe if your name was “Johnny Carson” or “Hugh Downs.” Not me and my friends. What we had were Kellners and Ramsdens (don’t ask) made from uncoated WWII surplus lenses. Which made NGC 6960 look like what? Like not much at all, not in a 35 degree field of view uncoated eyepiece. If you saw anything at all, it would just reinforce your idea that this showpiece of today was "impossible." Yep if you did find a “challenge” object after much squinting and cussing ("DADGUMIT! "), you likely wouldn’t find it very interesting because you wouldn’t know much about it. For the Messier, we did have the excellent Mallas - Kreimer “A Messier Album” series in Sky and ‘Scope to refer to—Evered Kreimer was one dude who could take astrophotos with Tri-X, that’s for sure. But there usually wasn’t enough data available on most objects to make them interesting or inform you about what you should look for in them. We did, thank God, have Scotty Houston and his “Deep Sky Wonders” column, but even Scotty couldn’t cover everything, and unless you had a library with back numbers of Sky and Telescope in the stacks (the Possum Swamp Public Library had never even heard of the magazine) or a buddy with plenty of old issues, you were out of luck. Well, at least we had pitch-black un-light-polluted skies back in the day, right? Uh… In my area, the skies were somewhat better, but not worlds better than they are now. By the time the 1960s began to wind down, developers were putting up shopping malls and used car lots with their millions of cobra-head lights with abandon anywhere in the rapidly bloating suburbs they could find space. Travel to a dark sky site? The thing was, unless you knew somebody with a bit of land out in the sticks you were stuck. There was Stellafane, but that was ‘bout it. No Texas Star Party, Riverside, Georgia Sky View, Cherry Springs, WSP, PSSG, MSSG, ISP, etc., etc. Just as “objects are closer in the mirror than they appear,” the bygone days of our amateur astronomy youth have assumed a GOLDEN glow that tends to soften and obscure the way things really were.